Moist, sweet, and full of all those autumn spices you love. 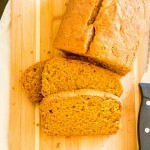 Serve your friends and family by sharing one of the extra loaves of homemade pumpkin bread. Pre-heat oven to 350 degrees. Grease and flour 3-9x5 loaf pans. In a large bowl, mix together the pumpkin, oil, sugar, and eggs until well-incorporated. In a medium sized bowl, whisk together the flour, baking powder, baking soda, salt, cinnamon, nutmeg, and cloves. Gradually pour into the pumpkin batter a little bit at a time, stirring after each addition until the mixture is well-blended. Divide batter evenly between the loaf pans and bake for 45-60 minutes, or until a toothpick comes out clean when inserted into the middle. Allow to cool completely in pans before removing the bread. Run a knife around the edges of the bread in the pan to loosen. Store any remaining bread in plastic wrap.